Dazed Digital: How did this whole thing come together? Gerry O Boyle: The project was Shane and his longtime girlfriend Victoria Clarke's idea. They rang me on a Friday night asking me to help put it together, and one week to the day, we were in a studio in Battersea recording it... It was literally that quick; a truly mental week. Shane, Victoria and I just called everyone up and asked them to jump onboard. Nick, Bobby and Johnny were the first to jump in, and then we made a few more calls and put the bill together. We wanted to make money for Concern – a very old established Irish charity that has actually been in Haiti for 15 years. Victoria rang them up and naturally, they said yes. Everything about the project was blessed. We did it on no budget, and just put together a headquarters in the back of The Boogaloo. DD: This is a snarling rock'n'roll monster with teeth sharper than Shane's new gnashers, why this song in particular? GB: It's a very different take on the charity single; this is very ballsy. Shane loves Haiti and he loves Screamin' Jay Hawkins, so he just thought it felt right. In his opinion, it's a hymn of love and a primal prayer to the fallen people. He feels the lyrics to "I Put A Spell On You'" are those of enchantment, love and primal prayer. DD: How did Johnny Depp become involved? GB: Johnny is an old friend of Shane's. He has appeared on one of Shane's albums before and is in the video for "That Woman's Got Me Drinking". 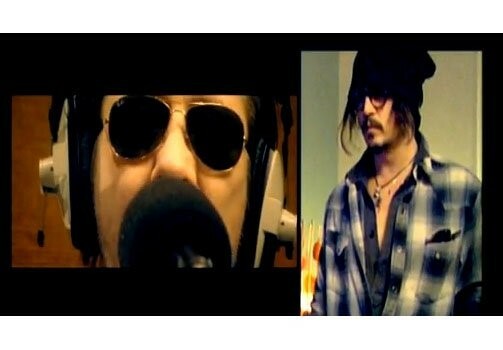 Everyone was in the studio on the day except Johnny who was working in LA, and he had to send his parts on to us. It was a pretty magical day, and it was a full moon with an eclipse. Shane was up early, and the first in the studio, which is really unheard of... Then, one by one, they all rolled up, some of the legends who have created the soundtrack for the last two generations: The Pogues, Pistols, Clash, Nick, Pretenders, Primal Scream, and, of course, the two young chanteuses Paloma Faith and Eliza Doolittle. DD: And who plays that awesome sax solo? GB: The sax player is Terry Edwards. He used to be in Gallon Drunk. We needed a sax and Glen Matlock just called him. He turned up, did his take and was gone within an hour, a true gent. DD: It sounds like the whole thing was done really fast! GB: Once we got the bill togther, we had to get a studio, then a producer, a date, a label to put it out, do clearances, you name it... it was manic. In the afternoon on the day before, while everyone was doing a rehearsal in The Boogaloo, I got a call from our initial label saying they couldn't do it! With two hours notice we had to get a new label and thankfully, we did... David Jaymes and Tom Haxell at IRL jumped in to bail us out. It was very rough and tumble, and the back office of The Boogaloo never saw more manic discussions... There is a Facebook campaign that started yesterday to make it number one, and we've only been on YouTube for three days but then again, we've got Johnny Depp! "I Put A Spell On You" will be available from IRL Records on download only via pre-ordering the single by clicking here. Or text SPELL (all in capitals) to 78789 (the text costs £1.50).